In 3-quart saucepan, combine all ingredients except fish, cilantro and sliced green onions. Bring to a boil. Add fish. Reduce heat; simmer 5 to 8 minutes or until fish flakes easily with fork, stirring occasionally. Stir in cilantro. Sprinkle individual servings with sliced green onions. Found in New Zealand's waters, orange roughy is a firm, white mild-flavored fish that's low in fat. 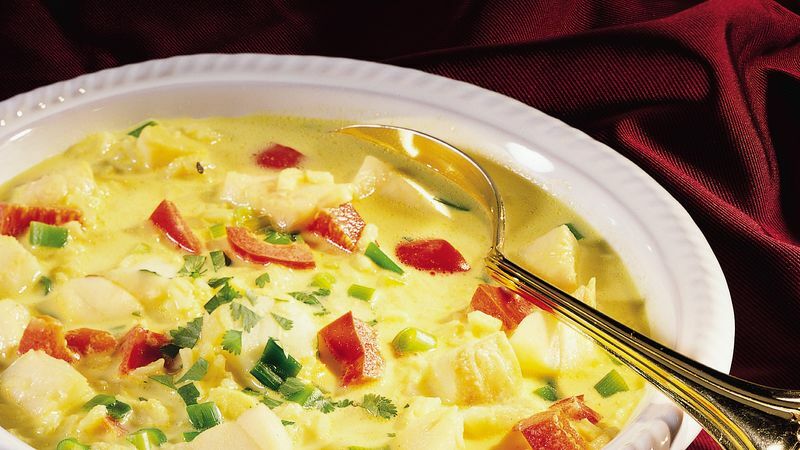 Other firm white fish, such as cod, haddock or halibut, can be used in this chowder.